Your opportunity to own at the Metropolitan! Priced under tax value! Amenity filled complex with Trader Joes, Target, Marshalls, the Greenway, CPCC and local hospitals all close by! 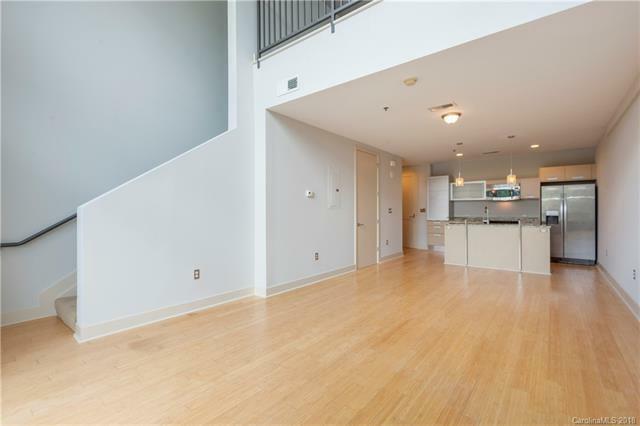 This loft-style condo offers an open floorplan w/soaring 2 story windows overlooking the tree tops, a glass door leads to a balcony. The modern kitchen features sleek European style cabinetry, stainless appliances, granite counters, a center island w/raised glass bar top; and is open to the dining/living area, a powder room serves guests. The spacious bedroom is upstairs along with large walk in closet & light filled private bath with laundry. Ownership includes membership to the MET clubs which includes pool & sundeck, outdoor kitchen, fitness center and lounge. Refrigerator, washer and dryer included. This convenient unit is located on the same floor as the parking garage level for resident parking and is an easy walk to it and an elevator. So much to do right at your doorstep!